You can have peace of mind that your important documents and media are secure from theft and fire damage in this safe. It carries third party ratings - UL and ETL laboratory ratings - not independent factory ratings. In the event of a fire, just get out of the house or office, the safe will protect all that is important to you. 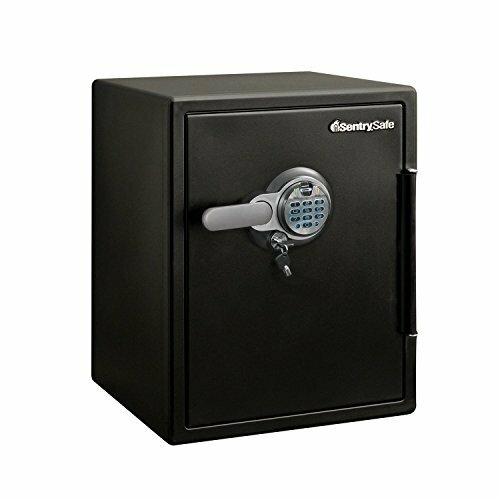 This safe is equipt with 6 - 1 bolts (which is 60% larger than traditional safes) and has a drop test so even if it falls 15 feet, it will stay closed & your documents protected. Safe can be opened by fingerprint scan or digital keypad entry. A bolt down kit is included so you can bolt the safe to any floor for added security.